Wonderful American Cookbook - includes beautiful pictures of The Gamble House and gives interesting historic information. The Gamble House is a winter house designed in 1908 by architects Greene & Greene for the Gamble family of Proctor - Gamble fame. Built at the height of the Arts and Crafts movement, it remains an important international architectural landmark and a monument to gracious living. Presented in Mrs. Mary Gamble's original handwriting and reinterpreted for today by celebrity chef Mark Peel, The Gamble House Cookbook brings the spirit of this legendary home into the modern kitchen. 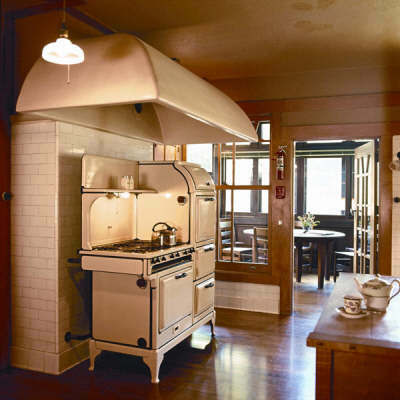 Architect Robert Harris contributes an appreciation of the Gamble House dining room gleaned from his memories of meals shared there with colleagues. This unique cookbook is filled with beautiful images by photographer Meg McComb that transport the reader back to a more relaxed time on the grounds and in the rooms of one of America's most beautiful homes.